I often wonder why I even own golf clubs. It's even more insane that I have 3 sets of golf clubs, let alone one. Why the bewilderment? How about the fact that I have not played a round of golf since last July? Yup, I really put those clubs to use as much as a car's turn signal in Richmond. It's not like I don't want to play golf. I just don't have time for it. However, when JuJu suggested we meet up for golf sometime, it got the wheels turning. Fine, I'll organize it. Seeing how I haven't seen Snake in ages, this was a good opportunity to get him out from the rock he's been living under. Do snakes live under rocks? Anyways, Costanza rounded out our foursome. To avoid the blazing heat, I picked 7:00am as our tee off time. Sounds great in theory, until you have to wake up at 5:30am in the morning on a holiday. #$&#(#&!!! I value my sleep and this was not a great idea. Despite not playing for a whole year, I still managed to shoot what I usually shoot (which is plain terrible). I was happy that I managed 5 pars; but combine that with 3 "others", that would mess up any score. 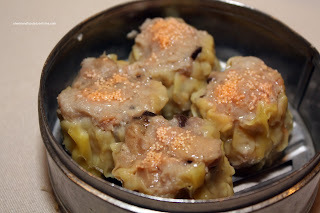 At the 18th, we threw some ideas around for lunch and ultimately settled on Dim Sum. 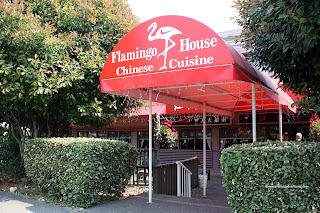 Being that we were starving by the end of the round, we decided to go to the nearest place which was Flamingo House. Now that is certainly a blast from the past. I don't even remember the last time I had Dim Sum here. 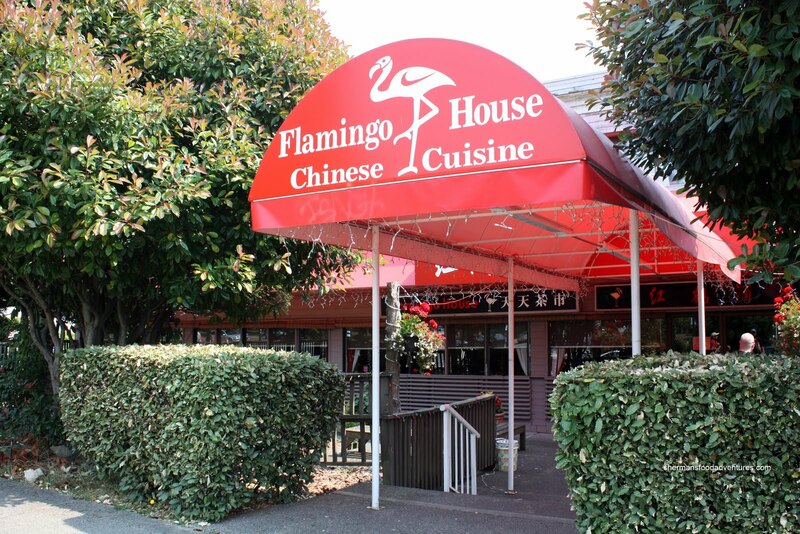 One of the originals from the 80's, this place has been serving up Dim Sum since I was a little kid living in Oakridge. They opened another location on Fraser; but it closed last year sometime (replaced by Fraser Court). As we made our way into the place, it certainly didn't look any different. Same setup with push-carts no less! Costanza remarked that the metal steamers looked really old school. We started with the Shrimp Dumplings and seriously, these were not very good. 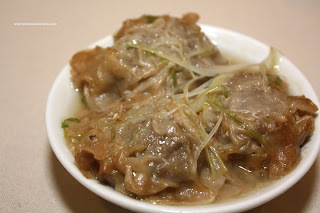 The dumpling skin was ultra thick and doughy. Inside, the shrimp was more of a mousse with bits of shrimp than actual whole shrimp. It was overcooked and I wasn't a big fan of the texture. Wow, these dumplings seem to come from the ghosts of Dim Sum past... As always, with shrimp dumplings, we have the Sui Mai (pork & shrimp dumplings). 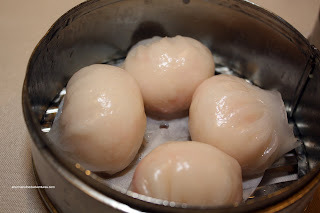 These were okay, at least better than the shrimp dumplings. I found the meat to be a bit dense. 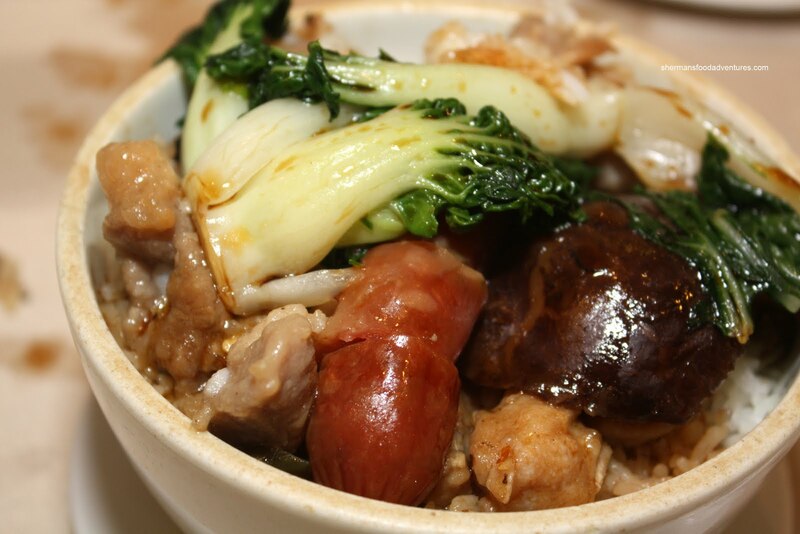 Normally, the ideal texture would be tender pork with a slight chewiness. These ones were not "loose" enough. We were so hungry, I think we just randomly ordered anything that came by. We normally do not order the Beef Short Ribs at Dim Sum; but we did this time. Looking like it had been lathered in SPF 60 sunscreen, the ribs were a disturbingly pale colour (trust me, the pictures don't do it justice). Furthermore, the amount of oil made it unappetizing. They were tender enough and garlicky; however, not a fan favourite. The same could be said for the Pork Spareribs. Equally as oily, these were unappetizing to look at. Moreover, they must've used a crapload of baking soda because the meat was devoid of any texture. One chew and the meat disintegrated. No issues with the flavours though. We had a slight communication problem with one of the push-cart ladies. I asked her what type of rice noodle rolls were on the cart. She said shrimp and beef. Fine, I said I wanted one of each. She proceeded to only grab the shrimp. I told her we wanted the beef as well and she proceed to only grab the beef (doesn't sound right, I know). Finally, after 5 tries, we got both the Beef Rice Noodle Roll and the Shrimp Rice Noodle Roll. Maybe I should just try pointing next time... Turns out it was not worth the hassle. The rice noodle was way too thick and doughy. At the very least, there was a lot of tender, well-seasoned beef. For the shrimp version, the picture is not shown because it's hard to see any shrimp anyways. There was, but in little pieces and severely overcooked. They ended up being gummy, unlike the cold-water crunch we all look for in a rice noodle roll. Knowing how much Costanza likes Stir Fried Sticky Rice, we got an order. I found this to also be subpar. The rice was overcooked; thus lacking the chewiness and "bite" that is consistent with sticky rice stir-fried from a raw state. Furthermore, the rice was very greasy. When the Steamed Tripe came around, no one seem interested. I quickly looked over to Costanza and he gave the "nod". Fortunately, he shares the same love for tripe as I do. Snake and JuJu wanted to have no part in it. Amateurs! How can anyone not like Offal? Don't they say that it is what's inside that that counts? Oh wait, that is meant for humans. 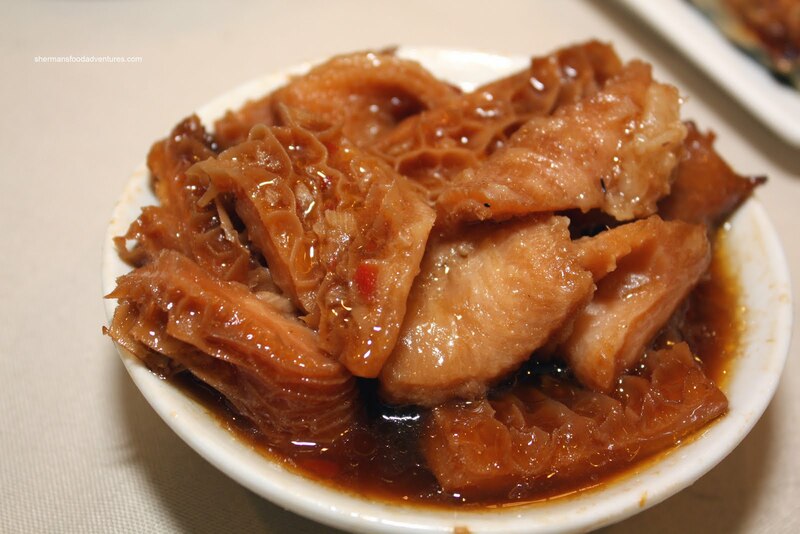 Anyways, the tripe was actually quite good. 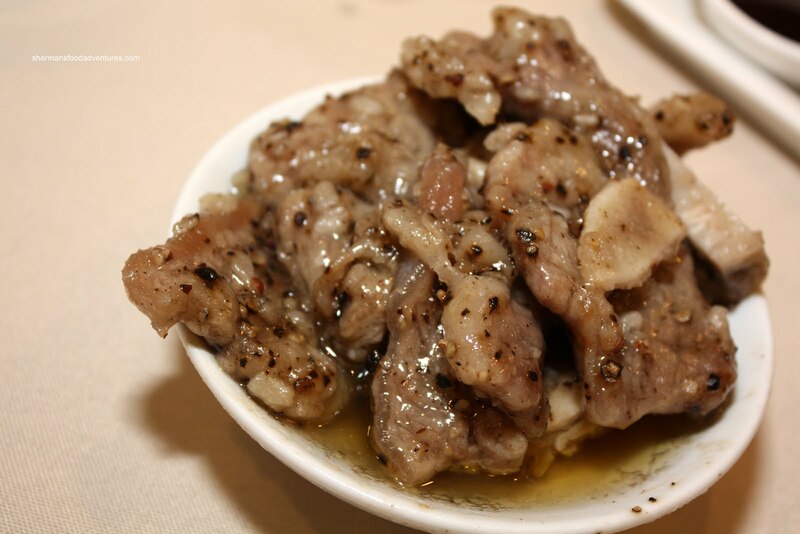 Tender and still with a bit of chew, the slices of tripe were well seasoned with a touch of chili flakes. 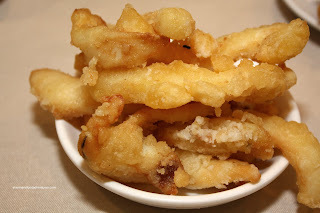 Another decent item was the Fried Squid. There was so much of it on the plate, it kept falling out while I was trying to take a picture. Thus, the hungry people at the table started eating it as a means to "help" me. Yah right. Bastards! The batter was on the thicker side; but it was still crisp and flavourful from the copious amount of salt. The squid itself was tender with some bite left. JuJu gets his nickname from his wife, who calls him a "little pig". I guess she is right, since we were all pretty full and he proceeded to order more shrimp dumplings and a Sparerib Rice. 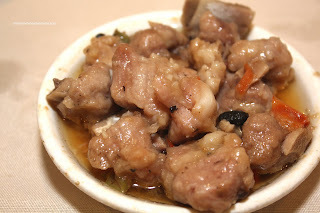 Once again, we got the mushy spareribs. 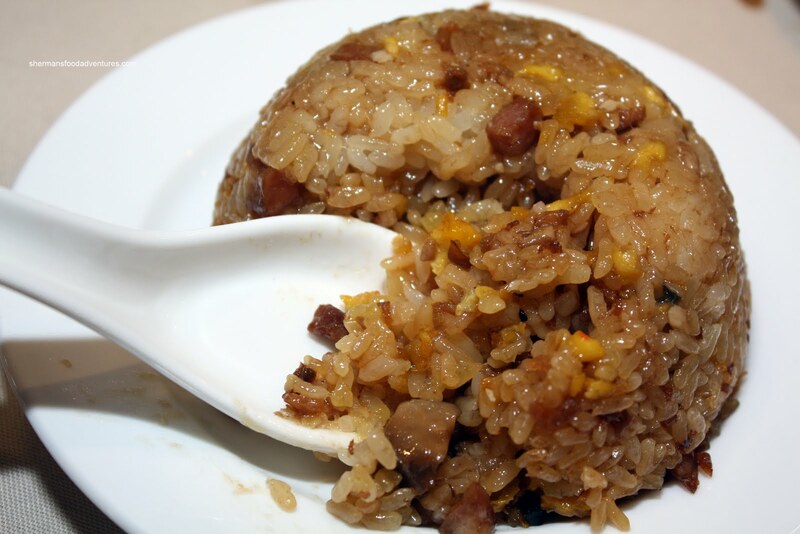 It rested on top of mushy rice as well. And you guessed it, very greasy too. It was a fairly large portion, reminiscent of ol' skool Dim Sum of the past. Normally, whenever we order beef meatballs, it comes in the form of 3 uniformly-shaped meatballs consisting of pureed beef with water chestnuts, cilantro and/or green onion. Sometimes, the bottom of the plate is lined with bean curd skin. The version here is the Beef Meatballs with ginger and green onion. I've had this version countless times; but rarely encased within wheat dumpling wrapper. For me, that really made the whole thing mushy and texturally odd. I didn't particularly like it. 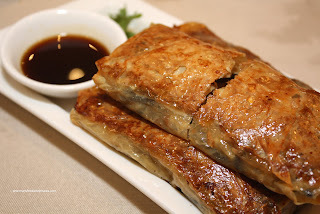 The Pan-fried Bean Curd Rolls was another dish that was disappointing. Normally, the draw of this dish is the crispy bean curd skin. 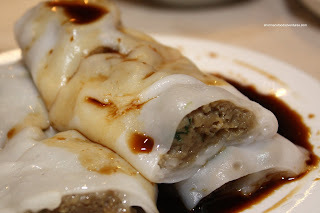 It's almost like a spring roll, except bigger and of course the bean curd skin replaces the wheat wrapper (and one is pan-fried, the other is deep fried). Rather than being crispy, the skin was chewy and almost impenetrable. Thus, everything fell out as I tried to eat it. Too bad really because the filling was quite good with wood ear mushrooms, shiitake and carrot. On a side note, these were being fried up along with other items such as noodles and potstickers at a pan-fry station at the front of the restaurant. That is pretty darn ol' skool! Now for a dish that is affectionately nicknamed by one of Viv's friends as "greasy grease balls". Why the name? Well, they are greasy and football in shape (before they were cut). 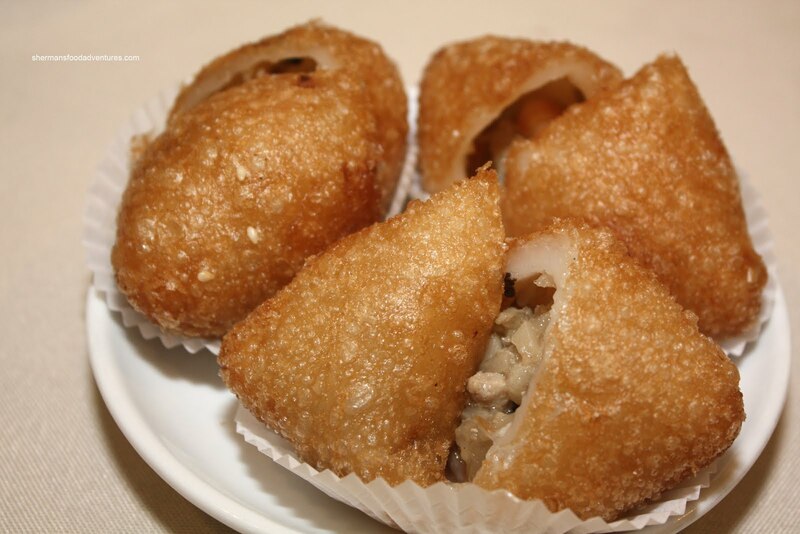 Comprised of sticky rice flour and filled with pork, these things absorb a lot of oil. But they are soooo good. In Chinese, they are called Ham Sui Gok or we'll just called them Fried Dumplings. These were no greasier than others I've had; however, they were not as crispy as I would've liked. 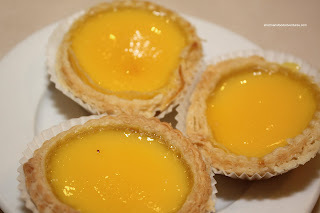 Lastly, we had the Egg Tarts. Well, not really, we got these quite early in the meal because they came by on the push cart. It just seemed wrong to talk about them at the start of the post. I didn't actually have one; but from all accounts, they were fine. From the appearance alone, the flaky tart shells are a bonus. I personally can't stand the hard tart shells that some places use (such as Anna's Cake House). So my revisit to Flamingo House for the first time in over 10 years was pretty average at best. It seems like they are stuck in a time warp of sorts, from the decor to the food. It is nice to have the nostalgia of the push carts and such; but the food really needs to be updated. It looks and tastes ol' skool, which may not necessarily be a bad thing for those who crave it. For me, I found it all too greasy. It would be better to head over to Golden Ocean, Spicy Court or even *gasp* Richmond for some better Dim Sum. With that being said, there was still some satisfaction from this meal. I guess I am getting old, I do way too much reminiscing. Same thoughts about Flamingo House. Grew up going there once or twice. Now, there are better choices in the area...just within 10-12 block radius. So my question to you is: Do you think the food has gotten worst? or do you think the other restaurants' food have gotten better? Anson, I don't believe the food has gotten any worse, it's just that there are better choices now. Same premise behind places like Ming's, Park Lok and Pink Pearl closing.